This chapter aims to explain how to help translating the documentation into another language than English. Some languages are already enabled for translating and some are not. Pleas see Request a new language if needed. This chapter is still being written. Please forgive any errors you find here and please report them to the mapserv-dev list with a [doc] flag in the subject. This chapter describes how to add a new language, how to join a language group, and how to translate the documentation. Transifex is a croudsourcing translation web application. It allows projects to let people easily translate documentation, websites, and applications. It offers a graphic interface for those of you who don’t like command line but also some features for those who love them. Transifex helps the translator to improve their translation with suggestions, glossary and proofreading process. 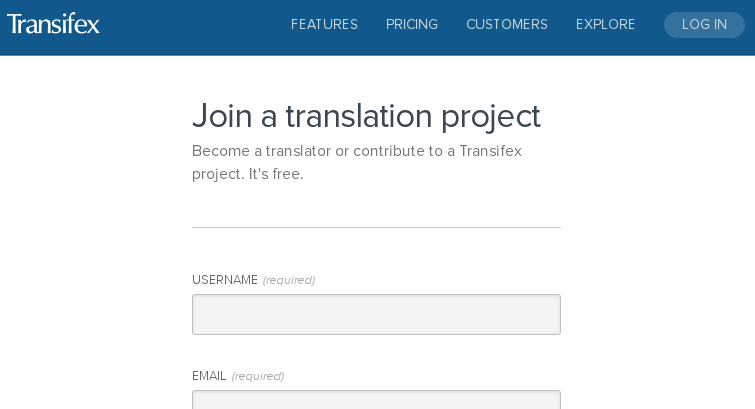 You need to subscribe to Transifex before translating. Go to Transifex subscribing page and create a new account. You can find more in the Transifex website. Each project has a news page to send some information to you, so please, take some time to read them. You can also send some messages to others to discuss on a topic. Click on the link to access the dashboard of the MapServer project in Transifex (link above), then the language you want to join and finally find the button Join team. You should now wait for the manager accept you in the group (given them time to read your request, some of them could not have so much time). For the MapServer project, asking a new language will add a new language group on Transifex and some stuff in the documentation repository. Don’t need to ask on the mapserv-dev list (but we will be happy to receive some message or feedback from you). Creating a new language by the manager should not be too long, actually as long as to accept you in the team. 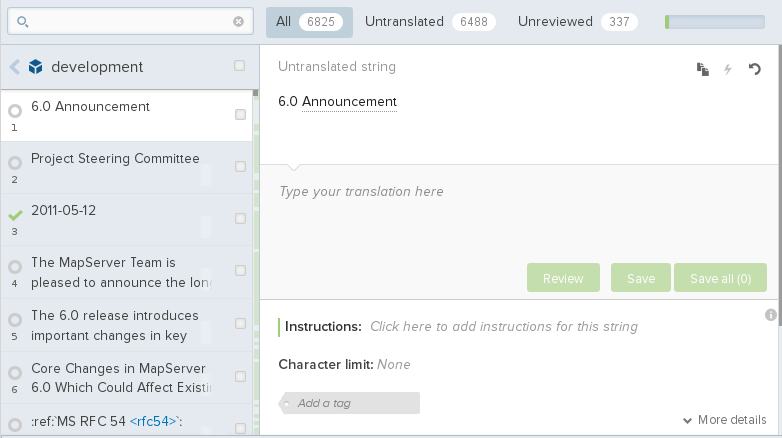 Describing the translation process could be an awesome task, so we are just going to describe the short way and we let you discover all the features in Transifex. Clic on the string on the left, translate it where ‘Type your translation here’ appears in the screenshot above. When finished clic on Save. Suggestion or glossary appear sometime on the right panel to help you. Duplicate : copy past the english string into the translated file (sometim used to let the translator easily duplicate identical string). Revert : revert your translated string. Clic on the Shorcut button to the right to find:w much more keyboard shorcut. Proof reading is similar to the translation process, except that you should be a reviewer to do it and you should click on the Review button instead of the save button. Please don’t review the string you translated or wait for some time before to be sure that you don’t miss some errors. 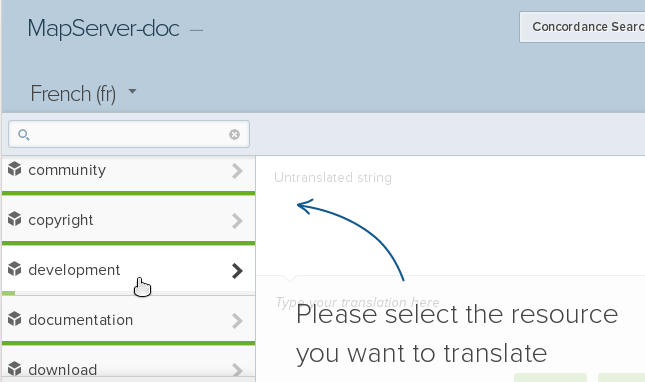 We need to push your translation into the doc repository then build again the documentation. This is not an automatic task so there is some delay between your file editing and the time where you can see them in the website. You can send an email to the mapserver-dev list to ask for someone to do the pull/push process for the translation. Why don’t I see my translation into the MapServer website?